Beno Gutenberg was born in Darmstadt, Germany on June 4, 1889. He attended the University of Gottingen and earned his PhD in 1911. As a student he chose geophysics as his course of study and eventually joined the Geophysical Institute. Emil Wiechert, whose work would serve as a foundation for Gutenberg’s research, had recently established this institute. Gutenberg’s dissertation was written on microseisms, which he later used to try to track hurricanes and typhoons during WWII (Mitchell). By the year 1930, Gutenberg made his transition from Europe to the United States. He joined the renowned Seismo Lab and became a professor of geophysics at the California Institute of Technology. The lab officially became part of Caltech in 1936 and Gutenberg became its director in 1947. It became the leading center for study of earthquake and the deep Earth (Mitchell). Beno Gutenberg was a driving force behind the acceptance of seismology as an international science of earthquake detection and study. In the year 1913, Gutenberg proved the existence of the Earth's core. He recognized that the P-wave shadow zone was due to the refraction and reflection of primary waves by the Earth's molten core. He also found that the S-wave shadow zone resulted from the complete absorbtion of the secondary waves by the liquid core. This information allowed him to calculate that the Earth's core began at 1800 miles (2880 km). Eventually, this core-mantle boundary was named after him and is known as the Gutenberg Discontinuity (www.bookrags.com). He is also well known for editing and contributing to the Handbuch der Geophysik (Mitchell). During the years of 1931-1939, Gutenberg worked on a series of papers with Charles Richter, a noted physicist after which the “Richter Scale” is named. Their article On Seismic Waves provides basic information on the travel times of several seismic phases through the Earth’s interior. They also described an area of low velocity in the Earth’s upper mantle that is still carries Gutenberg’s name today (Mitchell.) He worked alongside physicist Charles Richter at the Seismo Lab at Caltech. This is one of the world’s most renowned centers for geophysical research. Some of his other notable colleagues were Hugo Benioff and John Buwalda. Gutenberg led the study of teleseismic recordings used to study the Earth’s deep interior (www.seismolab.caltech.edu). While most of his career was focused on solid Earth geophysics and seismology, Gutenberg did spend a short time studying meteorology. In 1916, he served in Berlin at the weather forecasting service (McPherson.) Later, during WWII, he tried to use his earlier study of Microseisms to track hurricanes and typhoons in the Pacific (Mitchell). A microseism is defined as "a faint earth tremor caused by natural phenomena such as winds or ocean waves (en.wikipedia.org/wiki/Microseism)." Section B at 2885 km marks the Gutenberg Discontinuity, also known as the D" layer. Finally, previous Earth 501 students will probably remember creating frequency-magnitude diagrams for earthquakes in the New Madrid Seismic Zone. The proper name for these diagrams is actually Gutenberg-Richter Diagrams named after Beno Gutenberg and Charles Richter! Two examples are shown below. earthquakes in the New Madrid Seismic Zone. earthquakes in the New Madrid Seismic Zone compared to Southern California. “Brief History of the Seismo Lab.” Seismological Laboratory. California Institute of Technology. Copyright 2011. Available Online: http://www.seismolab.caltech.edu/history.html. Accessed June 1, 2011. California Institute of Technology. Image taken from: http://www.geophysik.uni-kiel.de/~geo43/images/gutenberg58.jpg. June 6, 2011. 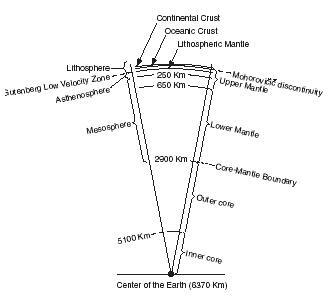 “Core Mantle Boundary.” Wikipedia: The Free Encyclopedia. Available Online: http://en.wikipedia.org/wiki/core-mantle_boundary. Accessed June 3, 2011. “Earth’s Interior.” ScienceClarified.com. 2011 Advameg, Inc. Available Online: http://www.scienceclarified.com/Di-El/Earth-s-Interior.html. Accessed June 3, 2011. "Gutenberg Discontinuity." Science.Jrank.org. Available Online: http://science.jrank.org/pages/3177/Gutenberg-Discontinuity.html. Accessed June 6, 2011. McPherson, Jeff. “Beno Gutenberg.” Emporia State University. Available Online: http://www.emporia.edu/earthsci/studen/mcpherson/benopaper.htm. Accessed June 3, 2011. "Microseisms." Wikipedia: The Free Encyclopedia. Available Online: http://en.wikipedia.org/wiki/Microseism. Accessed 12 June 2011. Mitchell, Brian J. “Beno Gutenberg.” American Geophysical Union. Copyright 2011. St. Louis University, St. Louis, Missouri. Available Online: www.agu.org/about/honors/bowie_lectures/gutenberg.shtml. Accessed June 1, 2011. Newman, A., Stein, S., Weaber, J., Engeln, J., Mao, A., and Dixon, T., 1999, Slow deformation and lower seismic hazard in the New Madrid seismic zone: Science, vol 284, p. 619-621. Phillips, Rachael. 2009. Course work for Earth 501. Image: "2007 Earthquakes"
United States Geological Survey. US Department of the Interior. "Shadow Zone." Image taken from: http://earthquake.usgs.gov/learn/glossary/images/shadow_zone.gif. Accessed 12 June 2011.